Before Miley Cyrus and Liam Hemsworth finally tied the knot late last year, a decade after they first met on the set of the film The Last Song, the bride had but one demand for their wedding. 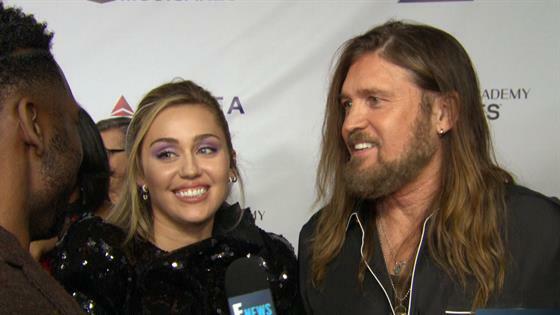 "Literally, vegan chicken and dumplings," Cyrus told E! News' Justin Sylvester at the 2019 MusiCares Person of the Year gala honoring her godmother, Dolly Parton. "That was my only rider," Cyrus continued. "I would do anything for dumplings. You could add nothing else. I didn't even need a dress; I was trying to wear leggings and a hoodie. I just wanted dumplings, that's all." Cyrus, 26, and Hemsworth, 29, wed in an intimate ceremony in front of family and friends at their Nashville home. And the bride did wear a dress—a gorgeous Vivienne Westwood gown. Hemsworth is clearly smitten with his new bride, who has taken his last name legally. On Saturday, Cyrus posted on Instagram photos of herself at the MusiCares gala. Under one of them, Hemsworth commented, "Good god." "Liam has been a part of our family for so long," her mother, Tish Cyrus, told Sylvester. "They've been together since she was 16 years old. So it's like, it's almost like not a lot different, I mean it is a little bit but it's really not because he's just a part of our family for so long that sometimes I actually kinda forget it happened until somebody asks, and then I'm like, 'Oh yeah, that did happen!'"